In the 1890's a fashion in silverware was created wherein each piece of a pattern were similar and related but were different. Gorham Corporation seized upon this new trend and created a series of six spoons and grouped them under the name "La Fleur"
which is French for "the flower"
This series of spoons in this were numbered on the back from 632 - 637. 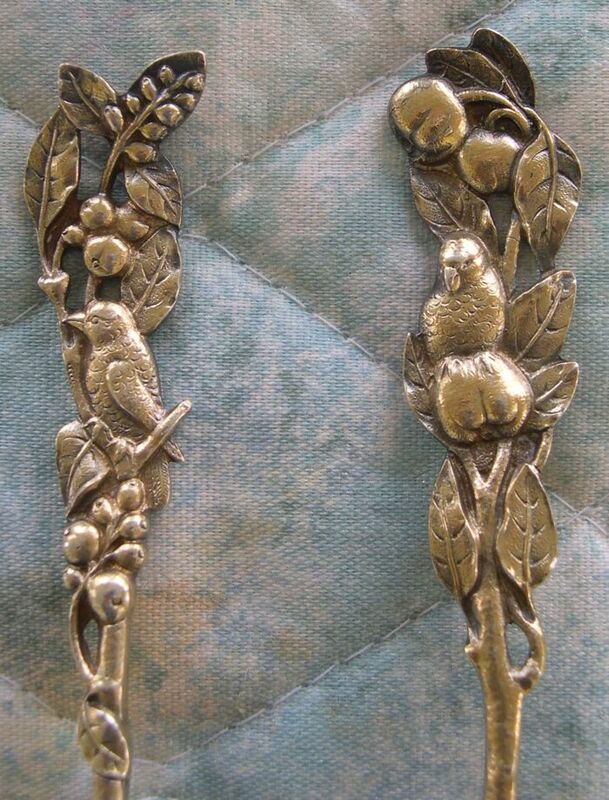 Interestingly, these are the only two spoons in this series which feature birds as all the rest feature flowers. The stems are also very realistic looking. The backs of the spoon are left plain. This spoon is similar, featuring lovebirds surrounded by foilage but was made by Paye and Baker. This spoon also features an engraved buffalo in the bowl.